FORD has given the strongest hint yet it's considering a life in Australia without manufacturing. 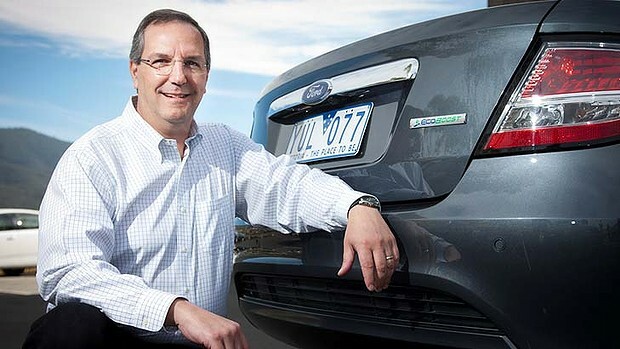 In a frank admission, the president of Ford Australia, Bob Graziano, said manufacturing was no longer critical to the Australian operation's survival. ''We believe you can have research and development without manufacturing. It clearly helps to have manufacturing and we're very fortunate in that we have manufacturing, research and development and a stunning test facility,'' he said yesterday. His comments are a strong indication that Ford is preparing to ditch manufacturing in Australia once its commitments to the federal and Victorian governments are over. In January, Ford and the two governments announced a $103 million deal to retain manufacturing of the Falcon and Territory models until the end of 2016. Ford spokeswoman Sinead Phipps told ABC radio that Mr Graziano was not implying that the company was planning to shut down manufacturing in Australia. "There was no hint implied in any way shape or form," she said. Ms Phipps said the Ford president was taking about "manufacturing in terms of the context of the design process". She said that Ford was currently investigating "what comes after" 2016 for manufacturing in Australia. With sales of the Falcon appearing to be in a terminal slump, and many predicting its decline before the natural end of the current generation in 2016, Ford has turned the spotlight on its ability to design and engineer vehicles for the global stage. Mr Graziano says the company's design and engineering operation is one of only three centres of excellence for Ford, along with headquarters in Detroit and Cologne. Ford says the number of design staff at the Broadmeadows facility in Victoria has almost tripled in the past 18 months. Mr Graziano said the increase, coupled with technological upgrades, has placed the organisation in a strong position to develop cars for the world. ''Australia is one of only 13 countries in the world that can design and manufacture a vehicle from the ground up,'' he said. ''The automotive industry is also the largest R&D contributor in the Australian manufacturing sector. Our ability to work on global vehicle programs is a critical part of this. Mr Graziano was speaking at the opening of a new virtual reality design studio in Broadmeadows that allows designers to sit in a virtual car years before it is built. He said the 1000-strong design and engineering workforce was evidence that Ford was not just a manufacturing concern. Ford sales year-to-date are down by 5 per cent in a market that is up 10 per cent. Most of that decline can be laid at the feet of the Falcon - sales of the big Aussie sedan are down by almost 30 per cent this year. Get all the unions together and get everyone striking from Cairns to Invercargil. Mind you, the Ford manufacturing plant in NZ has been a large bulk shed building retailer for a couple of decades. Life goes on. And the price of our old sixes will probably increase faster than expected over the next twenty years. Buy a shed. Put a few Falcon sixes in it for retirement money. start feeding the workers-RICE,its going offshore.will we buy it as a import. Yep, smart move Ford Aus. Just as dumb as most big companies. Keep moving jobs "offshore", until there are no good paying jobs left here in Aus. Then, it won't matter how cheap your Chinese or Indian car's are, we still won't be able to afford them! Somebody sack the Ford Aus CEO before he does too much more damage to Ford Aus & this country! costs too much,any profit ford made might pay him off,1001 reasons to move them to calcutta,cheap phones. I cry s**t on the cost of manufacturing here. That's not the real reason. If it is, GMH must be completely stupid to decide to & then implement manufacture of the cruize here! Does anyone think that the Accountants at GM head office would allow such a stupid decision to be made when GM is doing it tough to bring itself back from the red? Real reason is profit margin, nothing more. Yeah It would be expensive to sack the CEO, but more expensive to let him destroy Ford Aus! We require manufacturing in this country. Look at what happened to the USA's economy because they "off shored" so much manufacturing! The CEO should be batting for Ford Aus, making the USA use the falcon floorpan & underpinnings for the new Mustang, (would save Ford USA lots of development money) to help secure the falcon's future, as well as manufacturing in Aus's future too. Instead he seems to be throwing the match! Yeah, that would help for sure. what doesn't help is other manufacturers buying parts from other countries, at half the cost of what it takes to make a similar item here,plus get kickbacks from the government for importing, makes it kind of hard to run a viable Australian based business. And lets be honest, the quality of australian made gear has been sliding downhill for a while now anyway. They're starting to get the idea, lowering the 'basic wage' back down to somewhere realistic but that won't do anything but cut peoples throats unless the cost of everything else comes down. Typical 'halfa job' goverment attitude. They need to cap the big players multi million dollar salaries to stop this reverse robin hood economy. Stimulate the countries economy not the rich peoples pockets. Mining is another good example, Julia tries to cut in on their proffit (read: Greed) and low and behold, no proffit anymore! "Well we will just wait till you get your sorry a** voted out to start back up again now" another thing to thank the red headed monster for: Destroying the country at both ends. if the red headed clown can do a back door pay rise,we should tax it at 30% same as our super,not tax free. The Red Headed Clown should just do the Harry Holt. *edit: should probably make an effort to keep this on topic. I think the smell of fords failure in manufacturing has been lingering for a while. As with Australian manufacturing in general.